Climb. Reach. Achieve: The Skinny on Success, Why not You? 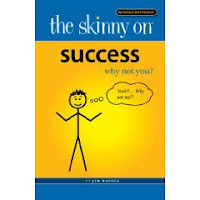 The Skinny on Success, Why not You? I had the privilege of getting my hands on a pre-released copy of a series of The Skinny on... books. It's called The Skinny on Success, Why not you? As the name suggests, the book breaks down how each and everyone of us can be successful (whatever it is success means to us). It’s a delightful and entertaining read that employs a very easy-to-digest, straight forward format. It is really unlike the typical books on success, or any book for that matter. If you are tired of reading books that are just filled with the bromides "you can do it!," "You can be anything you want to be"... I recommend you give this book a try. It not only offers validation and inspiration but a REAL insight into what it REALLY takes to MAKE IT! If interested, you can order by visiting the "Recommendations" tab located on the side panel to the left of the screen. To explore the award winning series The Skinny On... you may visit www.TheSkinnyOn.com. Interesting. It's certainly an option. I browsed a copy of this book. From the little i've read,it makes me want to read the entire book. I am going to purchase right now. ...and thank you too Senor T. It's really a good book.